A prominent visitor to Bugatti’s headquarters. Dr. Wolfgang Porsche, Chairman of the Supervisory Board of Dr. Ing. h.c. F. Porsche AG and Porsche Automobil Holding SE as well as Supervisory Board Member of Volkswagen AG and Audi AG, came to Molsheim to take a look at the history, the present and the future plans of the French super sports car manufacturer. He was welcomed by Stephan Winkelmann, President of Bugatti Automobiles S.A.S., and Christophe Piochon, Member of the Board of Management and Head of Production of Bugatti. For Wolfgang Porsche, his day in Molsheim began with a tour of the entire Bugatti facility including the Château Saint-Jean and the Atelier as well as brief trips with the Type 35, the most successful racing car of all time, and Ettore Bugatti’s pioneering full-electric car, the Type 56. The Chairman of the Porsche Supervisory Board also did not want to miss a test drive with the Bugatti Chiron1 or an inspection of the latest super sports car from Bugatti, the Divo2. The presentation of a photo showing his grandfather Ferdinand Porsche and Ettore Bugatti together at a car race, which Wolfgang Porsche had never seen before, was an emotional and nostalgic moment. His family and the honour of the family name have always been a top priority for Wolfgang Porsche. He was born in Stuttgart on 10 May 1943 as the youngest son of Dorothea and Ferdinand “Ferry” Porsche, founder of the sports car brand of the same name, and was already appointed to the Supervisory Board of Porsche AG in 1978. Since the death of his father Ferry in 1998, he has also had the honour and the duty to act as spokesman of his family. Upon the foundation of Porsche Automobil Holding SE in June 2007, he was elected Chairman of the Supervisory Board of this company, an office he had already held at Porsche AG since January 2007. He has been a member of the Supervisory Board of Volkswagen AG, Wolfsburg, since 24 April 2008. Wolfgang Porsche once described himself as a “Swabian Austrian” for whom a down-to-earth approach, reliability and tradition are important. He is characterized by his calm and objective manner, his wit and his humour. The father of four lives in Munich and Stuttgart and at his father’s “Schüttgut“ in Zell am See, which he acquired from the family estate. The enthusiastic hunter also has a special affinity for sports cars as his visit to Molsheim once again confirmed. Wolfgang Porsche has received many honours for his entrepreneurial activities. In 2005, the Austrian Chancellor presented him with the country’s highest honour, the Grand Decoration of Honour for Services to the Republic of Austria. 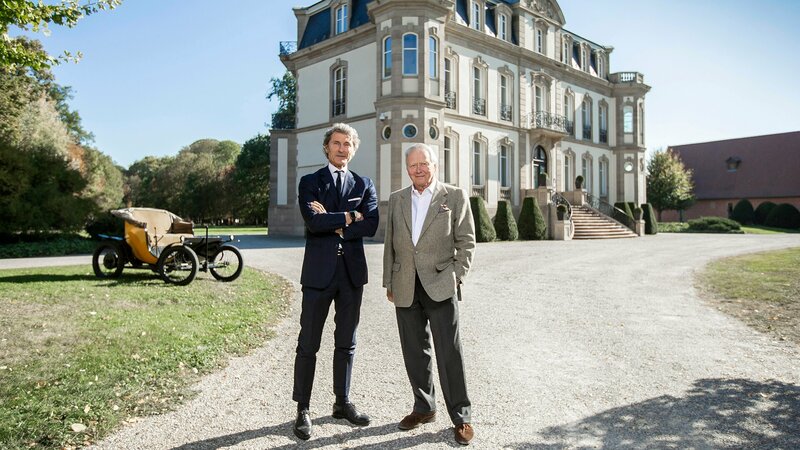 A Porsche at Bugatti: The Chairman of the Supervisory Board of Porsche, Dr. Wolfgang Porsche, and Bugatti President Stephan Winkelmann on the Bugatti premises in Molsheim. © 2018 Bugatti Automobiles S.A.S. A Porsche at Bugatti: The Chairman of the Supervisory Board of Porsche, Dr. Wolfgang Porsche, and Bugatti President Stephan Winkelmann at the Bugatti Atelier in Molsheim. © 2018 Bugatti Automobiles S.A.S. A Porsche at Bugatti: The Chairman of the Supervisory Board of Porsche, Dr. Wolfgang Porsche, and Christophe Piochon, Bugatti Board Member for Production, at the Bugatti Atelier in Molsheim. © 2018 Bugatti Automobiles S.A.S.